First let me say that anyone who has known discrimination also knows that going forward is steep. You have, after all, been told you don’t belong and worse, you’ve been instructed to get the hell out of town. As a blind person I’ve been in that spot throughout my life. Grade school teachers, high school principals, college professors, graduate school instructors–even a college president–have told me that because of my visual impairment I should go away. Perhaps the worst moment was in 1985 when I was enrolled in the Ph.D. program in English at the University of Iowa and two senior faculty along with the department chair told me I didn’t fit, that my need for extra time to complete assignments was ridiculous, and that I was a whiner. This is a familiar story among people with disabilities. Even today (over 20 years after the passage if the ADA) only one in four college students with a disability will graduate. The unemployment rate for pwds is still estimated at 70%. If you’re blind you can’t wait tables, drive a cab, or do most of the available jobs that are perfectly honorable. In 1985 all I could imagine was reading and writing vs. nothing. Nothing would mean living on Social Security Disability checks and moving in with my parents. If i embraced Nothing it would be an admission of failure so great that I would have to retire from my life, live as a kind of back room invalid, a prospect that terrified me since my mother was an alcoholic and slept all day with the shades drawn– would that be my life? As it happened, I did move home and lived for quite some time in my parents’ basement. I had a beat up typewriter, an exercise bike, and a tape machine and that’s when I began listening to Bob Marley in earnest. I’d been gently listening to Bob ever since his first US album “Catch a Fire” appeared in 1973 but now I was soaking in his rare and utterly astonishing combination of rage and redemption, a combination you will not customarily find in the arts–a combo like milk and iodine. In poetry very few possess this–Yeats comes to mind and Nazim Hikmet, and Neruda. In popular music almost no one has Marley’s quality of the sword in the cloud–the rage is just rage or the milk is just syrup. In my basement with the volume up I began working. Bob Marley’s voice and lyrics moved through me and I felt a half weightless sense of a pending disembodiment and then the authentic tears of deep deep discrimination salted with hope came to me. I could go on and on about the songs, the lyrics stitched from sublime wing shadows of the soul that fans the body, but it’s enough to say that Bob Marley remains for me the most authentic voice of “becoming” that I have ever heard. OK, well, of the two senior faculty members who denied you admission to the doctorate program in 1985, I will, if it has not already occurred (which I suspect it has), curse them so that worms eat their souls from the inside outward such that the sound of the noble worms steady munching disrupts the damned’s eternal rest forever. Gee, I’m beginning to see the value of witchcraft in a marginalized, disempowered older woman’s life. And, despite my general aversion to higher education, I might have a somewhat higher opinion of it if you someday dragged your aching bones through such program and became the sort of “doctor” that humanity truly needs. 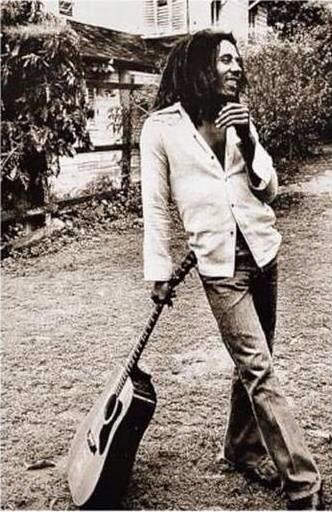 I was fortunate to learn about Marley early on, when I was married to my first husband, a Jamaican man. He was an awesome talent.